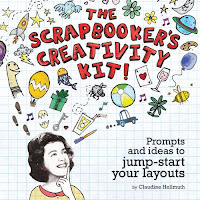 I can honestly say that the The Scrapbooker's Creativity Kit: Prompts And Ideas To Jump Start Your Layouts by Claudine Hellmuth is unlike any scrapbooking idea book I've ever had the pleasure of enjoying! I didn't do a whole lot of research into the the book before purchasing as I knew the author is a well-known collage artist and expected great inspiration, but I must say that I was a little surprised when I received my order in the mail. Housed with an approximately 7" x 9" hinged box (with the cover image shown here) was a 6" x 6" book with the look of a high school composition notebook, 30 double-sided word cards (each side has 2 words for a total of 120 word prompts), and 30 double-sided color cards (for a total of 60 color prompts). The idea behind this 'kit' is that the user would draw one card from the word cards and a color card or two and use those prompts to spark the inspiration for your next layout or project. There are a seemingly seemingly endless number of inspirational combinations that could be drawn from these little decks. Included in the mini book are layouts of the contributing artists based on six possible prompt combinations just to give the user an idea of the variety. Each prompt combination starts out with artwork from the author herself, Claudine Hellmuth, and is followed by one layout from each of the contributors - Kal Barteski, Ashley Calder, Donna Downey, Rhonna Farrer, Christina Lazar-Schuler and Genevieve Simmonds - for a vast range of scrapbooking style and technique. Each layout also includes a short statement explaining how the artist used the prompts and interpreted them into a successful (and beautiful) layout. After the contributing artists layouts are presented, there is an additional 4-page gallery featuring layouts by other talented scrapbook artists inspired by each of the prompt combinations. If you're looking for something a little unconventional, yet hugely inspiring, this book is for you! These prompts really allow you to explore your own stories and creativity! The great thing with this kit is that even though scrapbooking styles, techniques and more may change, the value of these cards never will because of their general nature. No matter how things change, these simple little prompts can be the start of your next great project today...or some day five years from now. 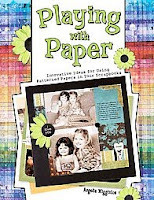 Visit the The Scrapbooker's Creativity Kit page at Amazon.com. You can also read more of my reviews for other recommendations.